Najeeb's job was to herd 700 goats owned by his employer who would watch him through binoculars to make sure that he didn't try and escape. He lived in a desert for two years, without seeing a single human being other than his cruel employer who tortured him. He did not even have a spare dress to change into. He herded 700 goats all by himself. At some point, he stopped believing that he was human and came to think he was one among the goats. Najeeb from Aadujeevitham (Goat Days) has touched the heart of all those who've read the 2008 Malayalam novel written by Benyamin. Translated to eight languages, the 130th edition of the novel is out. But who is the protagonist of this best-selling novel? Najeeb is not a mere figment of the author's imagination. He is a real person, based on whose life Benyamin crafted one of Malayalam literature's dearly loved novels. 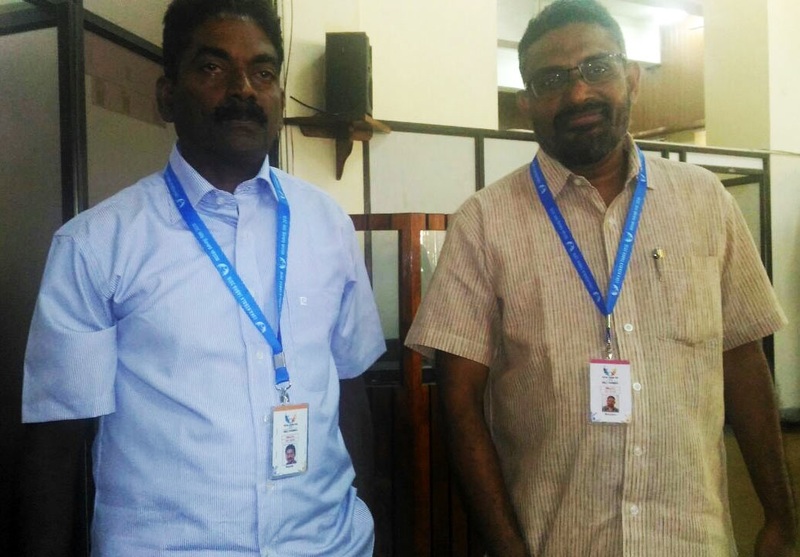 The unlikely hero of Aadujeevitham has come to Thiruvananthapuram as a delegate of Loka Kerala Sabha, the state government’s programme which involves Keralites living across the globe. Speaking to TNM, Najeeb recollects his first journey overseas - to Saudi Arabia, as a migrant labourer from a village named Arattupuzha at Haripad in Alappuzha. The year was 1993. Like thousands of Keralites who are not very well-educated, Najeeb also left his homeland in search of a job that would enable him to have a better life. He was told by the agent that the job is that of a salesman in a supermarket, but this was a blatant lie. “From the airport, it was a two-day travel and it seemed never-ending. From that itself, I realised that it was a trap,” Najeeb says. It was an acquaintance back in his village who'd introduced Najeeb to the agent in Mumabi who arranged for the visa. “I paid Rs 55,000 for the visa. We had to sell five cents of land to arrange the money. If the land was still there, it could have been sold for lakhs of rupees. The journey was via Mumbai. After reaching the desert, on the second day of travel from the airport, I didn't see a single human being other than my Arab boss and his brother. I was not paid a single rial as salary,” he says. Najeeb was reduced to tears after reaching the destination and he used to cry every day for the two years he was there - out of fear, pain and helplessness. His job was to herd 700 goats owned by his employer who would watch him through binoculars to make sure that he didn't try and escape. The employer lived in a small shed in the desert while Najeeb was made to sleep outside. "He had no remorse even when he saw me crying and would beat me. I had to eat stale kuboos. I would use goat's milk to wet the kuboos and eat it. The goats were not bathed and the stench would be there in the milk as well. But I had nothing else to eat, the kuboos was too dry to eat without the milk," he recalls. While the Arab would take a bath, he wouldn't allow Najeeb to use any water to bathe or clean himself. A long shift-dress was his only garment and he was never given anything else into which he could change. "The stench was nauseating but after a while, I got accustomed to it. My hair had also grown as I was not allowed to trim or shave it. There was nothing in the desert or the shed that was in the middle of it, and I was not allowed to see whatever the boss owned,” he said. The Arab’s elder brother would visit to take the goats to the market for sale and both were equally rude towards Najeeb. “I thought my life would end there and that an escape won’t be possible. At the time, when I left home, my wife was eight months pregnant with our first child. I was deeply worried without knowing how the delivery had gone and how she and the child, boy or girl, were doing. I hadn’t spoken to anyone for the entire two years I spent there, except to my boss. In the beginning, I didn’t understand a single word in Arabic and the boss used to beat me if I caught a black goat instead of a white one,” he says. One night in 1995, when his employer and the brother had left for the latter's daughter’s wedding, Najeeb was all alone. Eagerly waiting for such a moment to escape, he ran out of the place. He didn’t stop and just kept running. Seeing his reflection in a stream in a faraway place for the first time in two years, he became terrified. On the way, he saw another Malayali, in another goat-rearing area, living in the same deplorable conditions as him. “Only after he came near and whispered to me in Malayalam that he wants to escape, did I understand that he was a Malayali. His condition was as miserable as mine and since he was under the surveillance of his boss, he couldn’t escape. I hope he too escaped later,” says Najeeb. The moment when Najeeb meets the other Malayali is among the most poignant moments in the novel. “After running for one and half days, I saw a road. I stood there for hours trying to stop one vehicle. Many vehicles passed by and finally one stopped. An Arab was driving it. He was good-hearted and dropped me in Riyadh. I finally landed in the capital city of Saudi Arabia and managed to find a Malayali restaurant. They gave me food and a new dress. After two years, I was able to take a bath, shave and cut my hair. I was reborn,” Najeeb reminisces. Some of Najeeb’s relatives were there in Riyadh. After getting in touch and meeting them, he surrendered to the country’s legal system, the only option for migrants like him who have lost documents like passport and visa and have been cheated by agents. Najeeb was put in jail for 10 days. For a man who'd undergone such brutality in harsh conditions, jail was pleasant. “Life inside the jail was good, there was food, cleanliness and I could sleep,” he says. Finally, the big day came and Najeeb returned home. His son, Safeer was two years old when he met his father. Najeeb resumed working as a daily wage labourer. After two years, he was given a free visa to Bahrain by his brother-in-law. Benyamin used to work in Bahrain for years before he established himself as a writer and returned to Kerala. Najeeb’s brother-in-law’s friend Sunil, knew Benyamin. “I was told by Sunil that Benyamin is looking for someone like me to write on the life of migrant Keralites. We met through Sunil,” Najeeb says. Published in 2008, the novel turned Benyamin into an author to reckon with in Malayalam literature. “Yes, life has been divided into before and after Aadujeevitham. Before that, only those who read literature knew me. Aadujeevitham has been read by common people as well and has won me permanent recognition as a writer. All those who have worked in a foreign land, with their near and dear ones waiting for them back home, could relate to it," Benyamin said. Najeeb is 60 years old now and still works in Bahrain. His son Safeer was given a job by the Lulu Group after they came to know about Najeeb’s life. “Without the novel, who would have known me? I wouldn’t even be able to come to a programme like the Loka Kerala Sabha if Benyamin Sir hadn’t written about me,” says Najeeb, his eyes brimming.